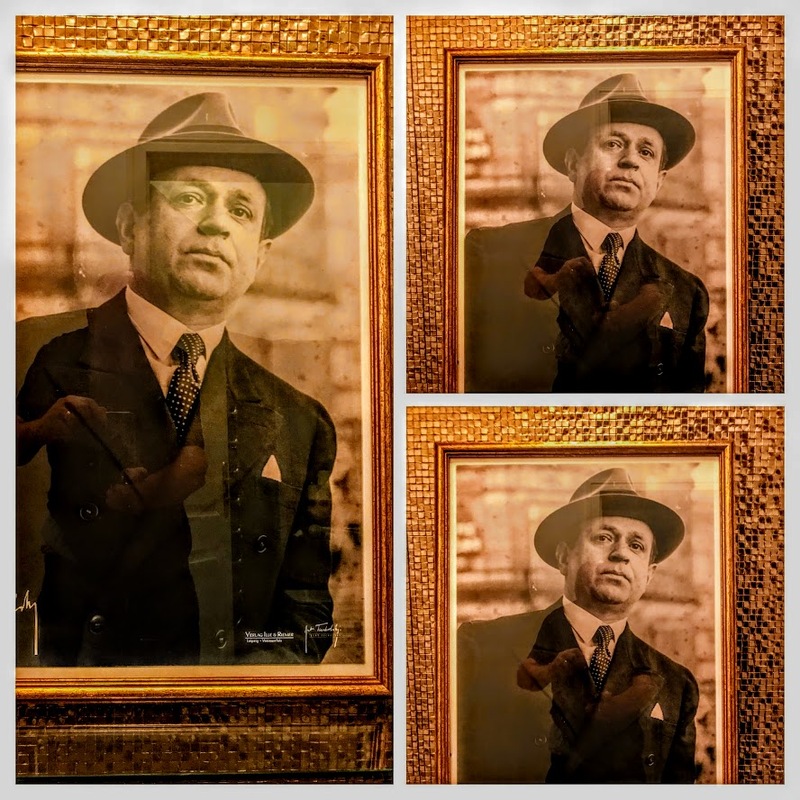 Every time I walk in or out of this apartment in Tucholskystraße, a framed photograph in the corridor reminds me that this street in Berlin is named in honour of the German Jewish journalist, satirist, and writer, Kurt Tucholsky (1890-1935), who was one of the early victims of Hitler and the Nazi regime and who is best-known for his cabaret songs. Kurt Tucholsky was born on 9 January 1890 at his parents’ home, a walking distance west of here, at 13 Lübecker Straße in Berlin-Moabit. His father, Alex Tucholsky, was a Jewish bank cashier who had married his cousin Doris Tucholski in 1887 and they had three children: Kurt, the eldest, Fritz and Ellen. 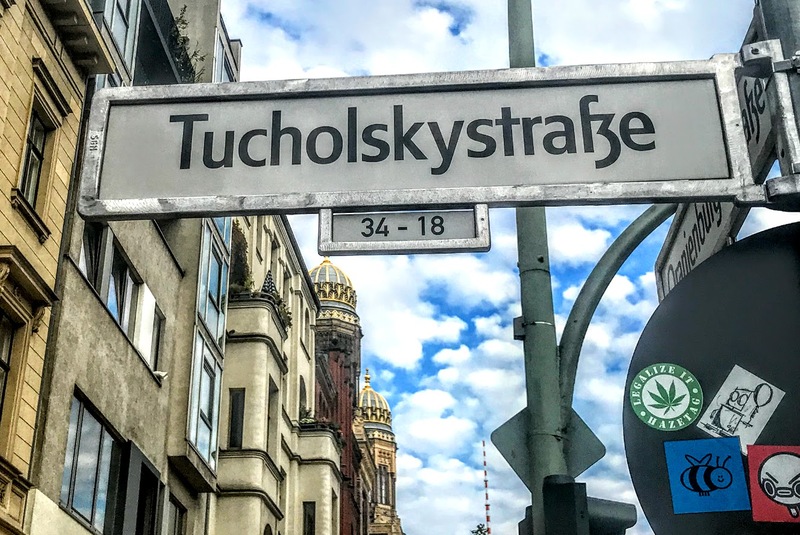 Alex Tucholsky was transferred by the bank to Stettin, now in Poland, and Kurt Tucholsky spent his early childhood there until he family returned to Berlin in 1899. Alex Tucholsky died in 1905, while Kurt was still in his teens, and left a considerable fortune to his wife and children. While he was still at school, Kurt Tucholsky wrote his first articles as a journalist. In 1907, the weekly satirical magazine Ulk (‘Prank’) published a short feature, ‘Märchen’ (‘Fairy Tale’), in which the 17-year-old Tucholsky made fun of Kaiser Wilhelm II’s cultural tastes. After his Abitur examinations in 1909, Tucholsky began studying law in Berlin that October, and spent his second semester in Geneva in early 1910. As a student, Tucholsky’s main interest was literature. He wrote more intensely as a journalist, including writing for the Social Democratic Party newspaper Vorwärts (‘Onwards’), and he was involved in the SPD’s election campaign in 1911. He travelled to Prague with his friend Kurt Szafranski in September 1911 to meet his favourite author, Max Brod, who introduced Tucholsky to his friend and fellow author Franz Kafka. Tucholsky completed a doctorate later, but never went on to a legal career: his inclination towards literature and journalism was stronger. The following year, Tucholsky reached a wider audience with the publication in 1912 of Rheinsberg – ein Bilderbuch für Verliebte (Rheinsberg – a Picture Book for Lovers), a tale in which he adopted a fresh and playful tone and which was illustrated by Szafranski. To support the sales of the book, the two friends opened a ‘Book Bar’ on Kurfürstendamm in Berlin: anyone who bought a copy of his book received a free glass of schnapps. It was seen as a student prank and came to an end after a few weeks. Tucholsky began an enduring and productive new phase as a journalist in January 1913 when he published his first article in the weekly theatre magazine Die Schaubühne, later called Die Weltbühne. The publisher of the magazine, Siegfried Jacobsohn, became Tucholsky’s friend and mentor, offering him both encouragement and criticism, sometimes co-writing articles with him, and gradually inviting him to assume some editorial responsibility for Die Schaubühne. His early career in journalism was interrupted with the outbreak of World War I in 1914, and for over two years he published no articles. Meanwhile, he finished his studies at the University of Jena in Thuringia in early 1915, when he received his doctorate in law with a work on mortgage law. By April 1915, he had been conscripted, and he was sent to the Eastern Front, where he was a munitions soldier and then as company writer. From November 1916 on, he published the field newspaper Der Flieger. At this time, he also got to know Mary Gerold, and they later married. A meeting with the jurist Erich Danehl resulted in him being posted to Romania in 1918 as a deputy sergeant and field police inspector. Danehl later appeared in his writings as ‘Karlchen,’ In Romania, Tucholsky converted to Lutheranism and he was baptised In Turnu Severin in the summer of 1918. He returned from the war that autumn as a convinced anti-militarist and pacifist. Meanwhile, through Tucholsky’s influence, the focus of Die Schaubühne shifted to politics. It changed its name to Die Weltbühne: Zeitschrift für Politik, Kunst, Wirtschaft, The World Stage: Magazine for Politics, Art, Economics, in 1918, and it became the voice of the intellectual left in Berlin. As a politically engaged journalist and co-editor of Die Weltbühne, Tucholsky became a social critic in the tradition of Heinrich Heine. In December 1918, Tucholsky became editor-in-chief of Ulk, the weekly satirical supplement of Berliner Tageblatt, published by the left-leaning liberal Rudolf Mosse, and he remained there until April 1920. Tucholsky moved to Paris in 1924 and then to Sweden in 1929. He who also wrote under the pen names Kaspar Hauser, Peter Panter, Theobald Tiger and Ignaz Wrobel. His picture book Deutschland über alles (1929) was written with John Heartfield, he published a second novel, Castle Gripsholm, in 1931, and he also contributed that year to Rote Signale (‘Red Signals’), a collection of poetry. Tucholsky was one of the most important journalists of the Weimar Republic. He was simultaneously a satirist, an author of satirical political revues, a songwriter and a poet. He saw himself as a left-wing democrat and pacifist and warned against anti-democratic tendencies – above all in politics, the military and justice – and the threat of Nazism. His output included aphorisms, book and drama reviews, light verse, short stories, and witty satirical essays in which he criticised German militarism and nationalism and the dehumanising forces of the modern age. His poetry was set to music and performed widely in German cabarets. His fears were confirmed when the Nazis came to power in January 1933. The last edition of Die Weltbühne was published on 7 March 1933. He was one of the first German writers whose works were banned in May 1933 as ‘un-German’ and burned. He was also one of the first writers and intellectuals whose German citizenship was revoked by the Nazis. Weakened by chronic illness, on the evening of 20 December 1935 Tucholsky took an overdose of sleeping tablets in his house in Hindås, about 35 km east of Gothenburg. He was found in a coma the following day and was taken to hospital in Gothenburg, where he died there on the evening of 21 December 1935. Recently, Tucholsky’s biographer, Michael Hepp, has questioned the verdict of suicide, saying it is possible that his death was accidental. The apartment I am staying in an apartment on Tucholskystraße is just around the corner from the Neue Synagoge or ‘New Synagogue’ on Oranienburger Straße, the main synagogue of the Jewish community in Berlin. After a day-long visit to concentration camp at Sachsenhausen in Oranienburg yesterday [12 September 2018], I spent a few hours in New Synagogue. With its domes, exotic and eastern Moorish style, and its resemblance to the Alhambra, it is an important work of architecture from the mid-19th century in Berlin. Jews have been living in Berlin since the end of the 13th century. They were expelled in 1573, but they returned to the city over the next 100 years, and in 1671 the Elector Friedrich Wilhelm granted two Jewish refugees from Austria and their families the right to settle in Berlin. The Jewish population in Berlin continued to grow in the 17th and 18th centuries, despite efforts by the Kings of Prussia to limit their number, and Jews in Berlin were prominent in various aspects of the city’s economic, intellectual and cultural life. Berlin became the first centre of Haskalah, the Jewish cultural enlightenment movement, and its most renowned exponent, Moses Mendlessohn, lived in this city. The Judische Freischule, established in Berlin in 1778, was the first Jewish institution of learning that taught the German language, and the curriculum included general subjects. In the 19th and early 20th century, the Jewish population of Berlin increased greatly – from 3,300 in 1812, to 28,000 in 1866, to 142,000 in 1910. The rapid rise was the result of a mass influx of Jews from provincial towns and from the eastern provinces of Imperial Germany, especially from Posen (today Poznan, Poland) and from Eastern Europe. A high percentage of Berlin’s Jewish population, therefore, was made up of Ostjuden or Jews from the East, and this situation had considerable impact on both the Jewish and the non-Jewish population of Berlin. 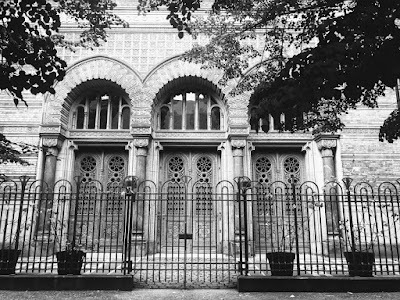 The New Synagogue on Oranienburger Straße was built in 1859-1866 as the main synagogue of the Berlin’s Jewish community. It was designed by the architect Eduard Knoblauch (1801-1865) in a splendid eastern Moorish style, inspired by the Alhambra,. When Knoblauch died in 1865, the project was taken over by Friedrich August Stüler, who took responsibility for completing the building and for its interior arrangement, design and decoration. The synagogue opened in 1866 in the presence of Count Otto von Bismarck, then the Minister President of Prussia. The front of the building, facing Oranienburger Straße, is richly ornamented with shaped bricks and terracotta, accented by coloured glazed bricks. Beyond the entrance, the building’s alignment changes to merge with pre-existing structures. 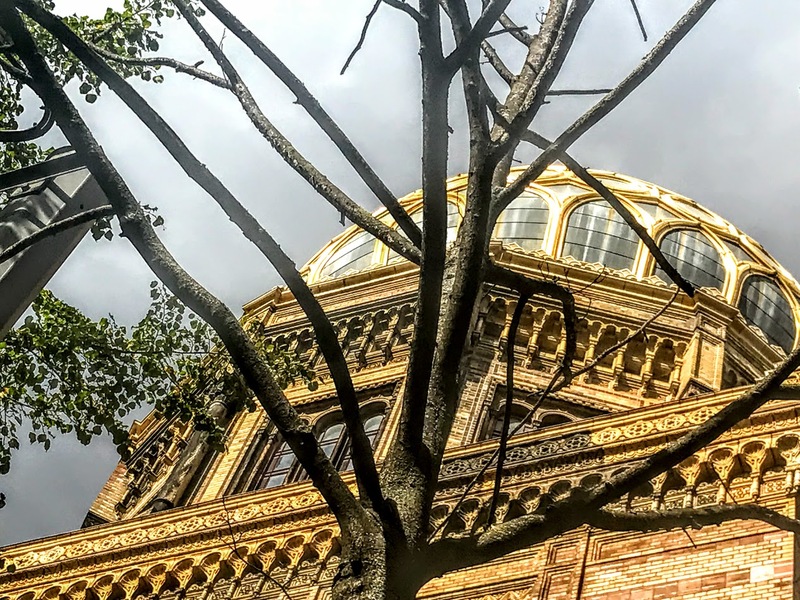 The synagogue’s main dome with its gilded ribs is an eye-catching sight. The central dome is flanked by two smaller pavilion-like domes on the two side-wings. Beyond the façade was the front hall and the main hall with 3,000 seats. Due to the unfavourable alignment of the property, the building’s design required adjustment along a slightly turned axis. The Neue Synagoge is also an early example of the use of iron in construction. Iron was a new building material and the iron used in building was visible in the outside columns, as well and in the construction of the dome. Iron was also a core component for the now-lost floor structure of the main hall. The New Synagogue was the largest synagogue in Germany at the time, seating 3,000 people. The building housed public concerts, including a violin concert with Albert Einstein in 1930. With an organ and a choir, the religious services reflected the liberal developments in the Jewish worship at the time. This was one of the few synagogues in Germany to survive Kristallnacht or the November Pogrom 80 years ago on the night of 8 and 9 November 1938, when Nazi mobs broke into the Neue Synagoge, desecrated Torah scrolls, smashed furniture and furnishings, piled them up and set them on fire. Wilhelm Krützfeld, head of the local police precinct, was on duty that night. He ordered the Nazi mob to disperse. He told them the building was a protected historical landmark and drew his pistol, warning he would use it to uphold the law for its protection. This gave time for the fire brigade to arrive and put out the fire before it spread to the main building, and the synagogue was saved from destruction. The New Synagogue remained standing, and was repaired by the congregation, which continued to use it as synagogue until 1940. Besides being used for prayers, the main hall was also used for concerts and lectures since other venues were blocked for Jews. The main prayer hall was last used by the congregation on Sunday 31 March 1940, this time for the final concert in a series of benefit concerts for the Jüdisches Winterhilfswerk or Jewish Winter Aid Fund, helping poor Jews who were denied government benefits. On 5 April 1940, the Jüdisches Nachrichtenblatt was forced to announce that services in the New Synagogue had been cancelled until further notice. Members of the congregation were told to remove their belongings from their shelves in the prayer hall by Monday 8 April 1940. The uniform department of the German army seized the building and used the main hall for the storage of army uniforms. 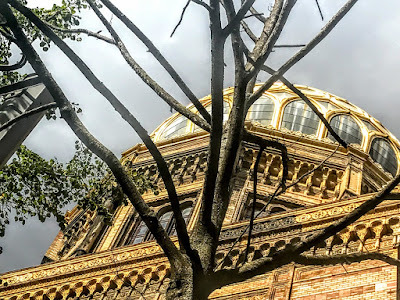 I was surprised to learn yesterday that the Jewish Community continued to use the office rooms in the front section of New Synagogue, including the Repräsentantensaal or hall of the assembly of elected community representatives below the golden dome. Some members of the congregation even held occasional prayers in this hall until September 1942, when they were forced to abandon the front section too. 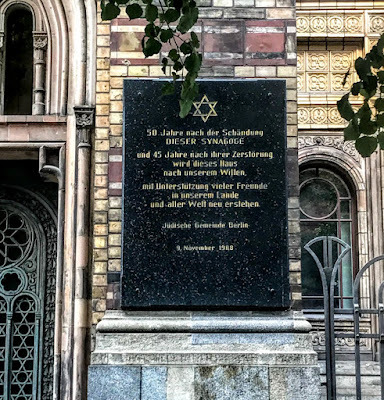 The New Synagogue was severely burned during Allied bombing in the Battle of Berlin, between 18 November 1943 and 25 March 1944, when the New Synagogue was hit on the night of 22–23 November 1943. The building to the left from the New Synagogue and the second one to the right at Oranienburger Straße 28 survived World War II intact, and the Jewish community returned to the building in 1946. In 1958, the Jewish Community of East Berlin decided to demolish the ruined rear sections of the building, including the soot-blackened ruin of the main prayer hall, leaving only the less-destroyed front section. The damaged, but mostly preserved, central dome on top of the front section was also torn down in the 1950s. 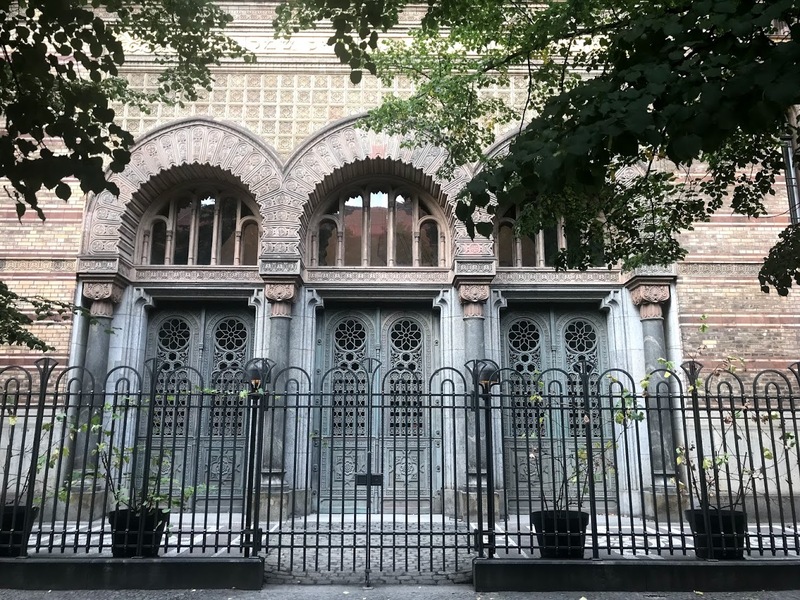 At the time, East Berlin’s Jewish Community, impoverished and diminished after the Holocaust, could not foresee any future opportunities to restore the New Synagogue. But with the fall of the Berlin Wall in 1989, rebuilding of the front section began. From 1988 to 1993, the structurally intact parts of the building close to the street, including the façade, the dome and some rooms behind, were restored as the Centrum Judaicum or Jewish Centre. The crown of the main dome was put in place on 5 June 1991. 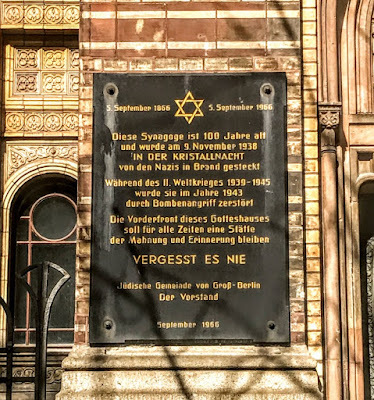 Since 5 September 1991, the restored gate of the New Synagogue – once the largest and most beautiful synagogue in Berlin – displays in gold Hebrew lettering the inscription it bore when it was first dedicated: ‘Open the gates to let a righteous nation in, a nations that keeps faith’ (Isaiah 26: 2). By 1994, the Grand Staircase had been restored; and the new foundation stone was unveiled on 9 November 1998, 50 years after Kristallnacht. Although the main sanctuary was not restored, a small synagogue congregation was re-established in May 1995, using the former women’s wardrobe room. I also climbed to the top of the dome yesterday afternoon. The present building on the site is a reconstruction of the ruined street frontage with its entrance, dome and towers, with only a few rooms that have survived behind it. It is truncated before the point where the main hall of the synagogue began. The congregation is the Berlin community’s only Masorti synagogue. Most of the building, however, houses offices and a museum. In 1935, Regina Jonas (1902-1944), who born in Berlin, became the first woman to be ordained as a rabbi. She died in Auschwitz in 1944. Gesa Ederberg became the first female pulpit rabbi in Berlin in 2007 when she became the rabbi of the New Synagogue. Jewish services are now held again in the New Synagogue. As the first woman rabbi to serve in Berlin since the Holocaust, she has helped her reinvigorate the German community that once represented the cutting edge of liberal Judaism. Born a Lutheran, she first visited Israel at the age of 13 and slowly fell in love with Judaism. She studied religion in Germany and Israel before converting to Judaism at the Jewish Theological Seminary in New York in 1995. After returning to Berlin, she entered the rabbinical school at the Schechter Institute of Jewish Studies in Jerusalem, and she was ordained in 2003. She was a founding member of the General Rabbinic Conference of the Central Council of Jews in Germany, and in 2006 she helped found the European Rabbinical Assembly of Masorti/Conservative Rabbis. She returned to the Oranienburger Strasse Synagogue as the new rabbi in 2007.